It should be fairly obvious to anyone who knows me that books such as The Paper House are not yours truly's run of the mill material. For a start, it is fiction; and further, it is not science fiction, which happens to be my main route down the dark alley of non-non-fiction. So, why Paper House? It's because I know the author, Anna Spargo-Ryan, from Twitter. And it's because she happens to be a fellow resident of Melbourne. 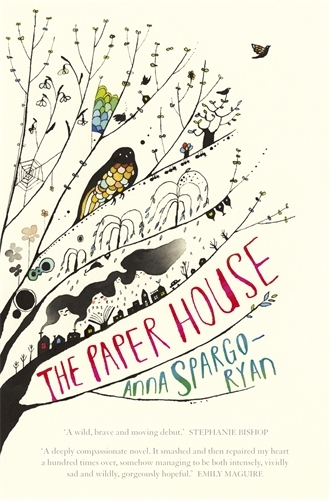 And, as it happens (not that I knew it in advance), The Paper House is as Melbourne a book as a book can be. But just in case you are still worried, I will add that Spargo-Ryan is alright: she's a gamer, and she even got the Switch the day it came out just so she could play Breath of the Wild. Case closed. The Paper House's hero is the classic anti hero. A modern day Melbourne woman, happily married, is expecting a child. So much so that our family of two moves out of the lively inner city to the quiet outer suburbs, where they can afford a home fit for a family. Life takes the odd turn, though, and our hero goes through the stillbirth of her child pretty close to the end of its due term. Not surprisingly, she is devastated by the experience; however, her particular case seems to carry that devastation an extra notch or two. At which point our book's mechanics kick into action. For every chapter on the latest in the story of the hero coming to terms with her loss, we have a shorter chapter from her childhood. Together, the tales of past and present converge to portray the image of a dysfunctional family haunted by a severe case of mental illness in their midst. As you can imagine, the chemistry of past and present tale builds up as the book goes. The beauty of The Paper House lies in not that much happening, story wise, while still filling a book up. Credit goes to Spargo-Ryan for rich language and tons of little details that do an excellent job in the suspension of disbelief department. To give but one example, the hero's accounting of hospital parking costs stroke a chord with this reader. I would argue that the ability to create so much depth with so little is testimony of great writing. Overall: I would say The Paper House proved an excellent break from my usual reading material, one that was both enjoyable and educational. If you seek a Melbourne centred book and do not mind a couple of hundred pages filled with sadness, do give this book and this author a go. 4 out of 5 crabs from me.